THIS ESTABLISHMENT IS CLOSED The ceiling stars may twinkle, but it's Yannick Cam's cooking that lights up the night. 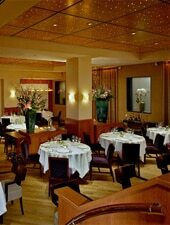 : THIS ESTABLISHMENT IS CLOSED Chic, elegant Le Paradou vies with just a handful of other destinations as DC's most expensive restaurant. With a menu devised by executive chef Yannick Cam, that's no wonder. That said, Le Paradou may well be the ideal location for marriage proposals, brokering million-dollar deals and signing up mega-star talent. As expected, every detail is honed to perfection: a beige-on-white-on-tan color scheme is brightened with color splashes from tiny roses at each table and two towering vases of flowers in the main dining room. It's all impressive, with a menu which reads like a page from a classic French cookbook. Appetizers include a delicate lobster claw salad for which the shelled claw perches on a mound of diced avocados in a pool of thinned gazpacho. Remembering Cam's lamb delights from an earlier restaurant venture makes the selection of roast rack of lamb the obvious entrée choice---and a good one at that. Partially boned, the rack merits its own wine-bolstered juices. A clutch of wild mushrooms and a few stalks of peeled, tender asparagus complete the plating. And to start, two amuse-bouches---a teacupful of velvety English pea soup and a tiny portion of salmon tartare wrapped around a sprinkle of caviar and all over-wrapped in a phyllo crust. Parisian desserts, of course, and why not indulge in a warm fresh fig tart or an apricot vacherin? If you decline, that's no matter, for with your bill comes a plate of thimble-sized sweets. Divine.